If grey hair is all over the head, you can use 5k, this will create highlights on the grey hair and Copper Chestnut on the rest of the hair. On more than 5% you must use this formula. Mix 25ml of 6N, 35ml of 5R, 60ml of glycol to get a Copper Chestnut. Mix 30ml of 6N, 3Oml of 5R, 6Oml of glycol to get a Copper Chestnut. Mix 45ml of 6N, 15ml of 5R, 60ml of glycol to get a Copper Chestnut. This formula will apply for 5D (Light Golden Chestnut), 7D (Golden Blonde), 8D (Light Golden Blonde), 5M (Light Mahogany Chestnut), 7M (Light Mahogany Blonde), 7R ( Copper Blonde), 8R (Light Copper Blonde and 7C (Ash Blonde). With Herbatint haircolour you can change the tone of your hair (for instance, from Gold to Ash), it can be used to lighten by up to 3 shades and will cover grey from the first application. It is possible to lighten natural hair by one or two shades on brown or chestnut hair and two to three shades on light chestnut or blonde hair. Can lighten previously tinted hair by two tones. Do not colour your hair immediately after a perm. We recommend waiting two weeks and then shorten the processing time by 10 minutes and use a shade lighter than your target shade. range in equal parts. Do not mix together two shades of the golden range. Well-known for its anti-oxidizing and anti-inflammatory properties, rich in vitamins, enzymes, panthenol and natural minerals. Protects and nourishes the hair whilst colouring. Rich in Vitamins E - F. Ensures better colour cover and long lasting colour results. Treats the scalp, rich in flavonids and essential oils. Hair tonic and re-mineralizing agent. 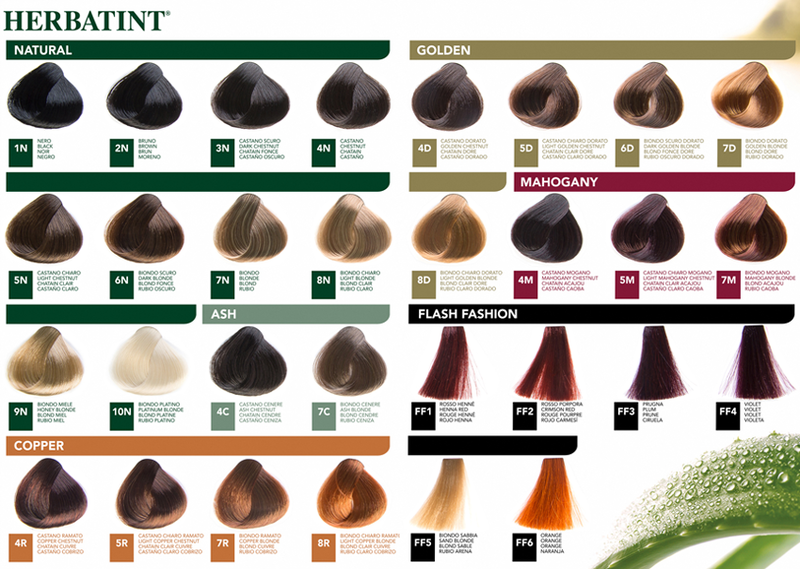 As with any hair colour system, the success of these products depends very much upon following the instructions given on the product packs, the condition of your hair and the colour you choose. Although Herbatint/Vegetal are gentle products, they may stain your fingernails so the use of gloves is advised. Dry, permed, treated and grey hair tends to be more porous than normal hair and will therefore take up colours more readily. The effect will be a more intense colour and this should be borne in mind when selecting which colour you require. Always test products on a small piece of your own hair, before undertaking the complete treatment. It is particularly important to leave the products on for the times given. Colours may appear much more intense or even totally different whilst processing takes place. They will not therefore correspond to the colours in the colour chart until the full processing time has elasped. We strongly recommend the use of the Herbavita Normalising Shampoo and the Royal Cream each time the hair is coloured, to prolong the life of the colour and ensure perfect condition every time. This is particularly important after using Herbatint. 1. Using a plastic or glass container mix equal and sufficient color and glcol developer in equal parts enough to suit the length and volume of your hair. Replace the caps on the bottles containing unused products, and retain for future use. 2. Using mixture apply on dry and unwashed hair. 3. Apply mixture to the regrowth area and leave to develop for 30 minutes. 4. Apply remainder of mixture through the rest of the hair and wait a further 10 minutes - Total 40 minutes. 3. Apply mixture through the whole length of hair starting at the roots. 4. Leave on foe 40 minutes. During this process the colour of the product may differ from targeted colour, this is quite common and doesn't have any effect on the final colour. 5. Once processed rinse hair untill water runs clear. 6. Shampoo hair - prefably using a shampoo from the Herbatint rnge for best results, rinse and towel dry. 7. Apply the Royal Cream Conditioner, leave in for 5 minutes & rinse again, then style as usual.